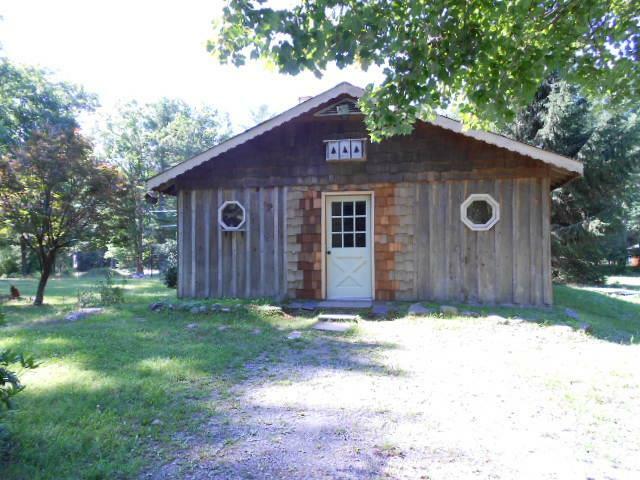 The farm came with a house and much of the first year was spent creating a home. Always mindful of my budget, by the end of 2016 I had designed, concocted and earned-by-sweat a comfortable place to pursue my farming endeavors. That's what we're looking for, right?- a homey place to end the day. Now it's Home Sweet Home to me. My newsletters from the first year were a mix of gardening, berrying and home remodel. The excerps below tell the tale of the house renovation, with tips of how to make a home on a budget. For more homemaking tips, CLICK HERE for Newsletters from 2017. For newsletters from 2018, CLICK HERE. I bought the farm... and it was pretty humble beginnings- everywhere. The yard was strewn with what most would consider garbage and the house was a total fixer-upper. But I do like a challenge. The house contained a (fake) stone wall surrounding the wood stove which was covered in soot and smoke stain so that's where I started. My sister Tracy helped and we got rid of that wall in just a few hours. The wall between the two small bedrooms was opened to make a large master bedroom and dressing area. It's hard to create space in a 758 sqft house, but creating the feeling of space, is something I can do. 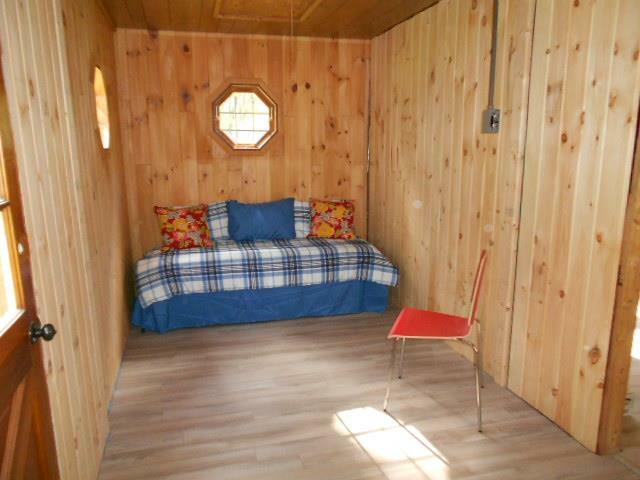 For anyone thinking I've cut out the guest room, don't worry- I'll be making a bunk room for visitors. driveway side. The original sliding door was broken and couldn't lock. My sister Tracy and her fiancé Michael came to help with demolition on the house. They brought a lot of skill- I'm saying MAD SKILLS- and we got so much done. It's really amazing, and wonderful, what can be achieved by energetic people. 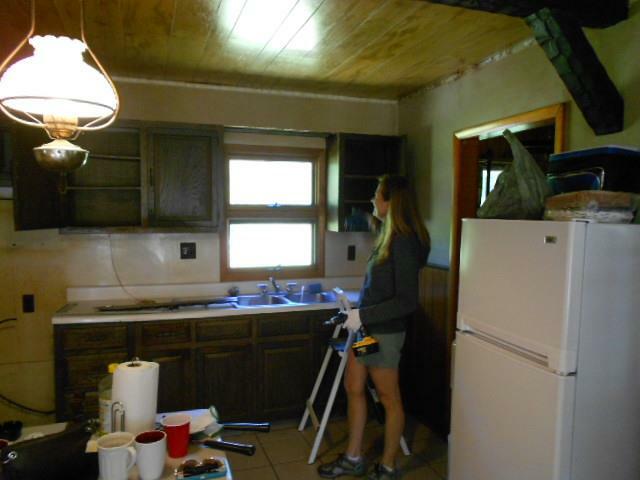 Tracy grabbed the crow bar and got the old- and quite disgusting- kitchen top cabinets down. It's hard to tell, but this is much improved! I wanted to FINALLY finish the bedroom construction so I can move onto the good part- decorating and finishes. 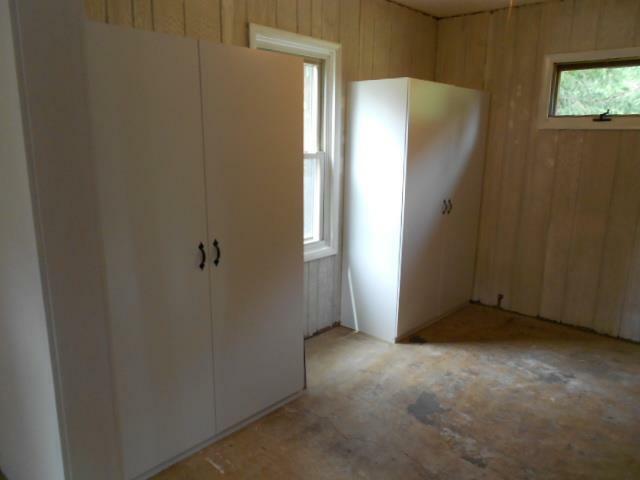 The walls are prepped with 3 different, salvaged sheets of paneling to cover where the old closet was, the door to the living room covered and it's ready to paint. The floor had tar paper (?) covering the concrete slab, so that's gone and I'm in the process of selecting laminate flooring- now the fun part! The original second bedroom will be a closet for the master, and that too is ready for paint and finishes- at last, something ready for the pretty stuff! 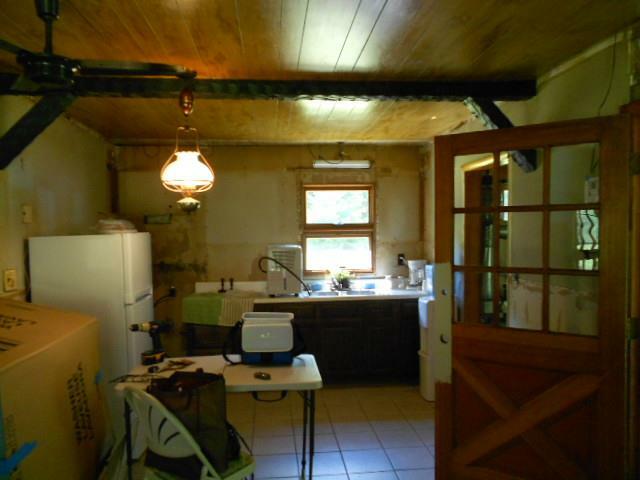 Renovating houses is not a new interest of mine- I've been learning at it for more than 40 years. This is a photo of my wonderful sister Vivian (left) and myself standing in my first rehab project which we worked on together- circa 1977. It was summer and we were young. Because it was a rainy weekend, I had a chance to do a lot on the house. I'm a careful carpenter and everything takes me twice as long as a tradesman- but I like it and it's fun for me. I'm waiting for tradespeople on a lot of projects so doing a quick inventory- Front door moved?No. Bedroom ceilings installed? No. 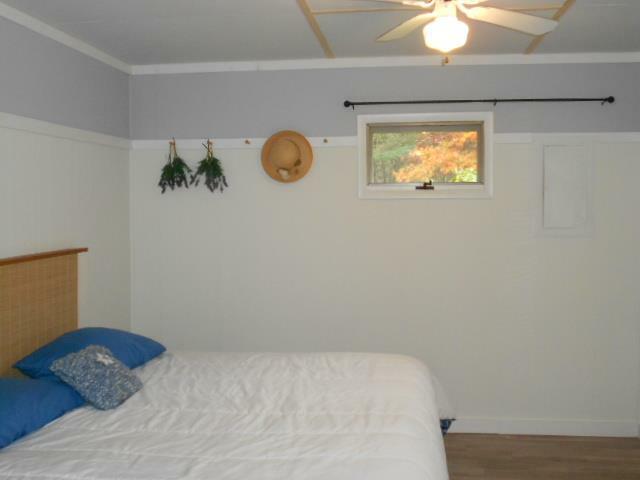 Electric to bedroom completed? No. Furnace removed? Yes- OMG, I get to work on the laundry room! While I hope you never have to clean up old grease- I mean disgusting, tacky, goopy,1/8' thick grease stuck around where a furnace once was- I'd like to share a tip (Heloise audition?). Squirt Dawn dishwashing detergent on the grease, let it sit for about 15 minutes and scape up with a metal scraper. Squirt more Dawn, brush with a wet brush and voila! it's gone. What I thought would leave me crying, turned out to be one of the easiest things to clean up. In short (and because I didn't take pictures) I framed out a wall from the kitchen into the laundry room to recess the refrigerator, added the door frame to the new door opening my friend Michael Winstanley cut out for me a few weeks ago, primed then painted the walls and ceiling of the laundry room and installed peel-and-stick tiles on the floor. While I wouldn't have guessed it, the laundry room is the first room even close to being done- it just needs the windows painted and some baseboard trim around the new floor! Finally, real progress! 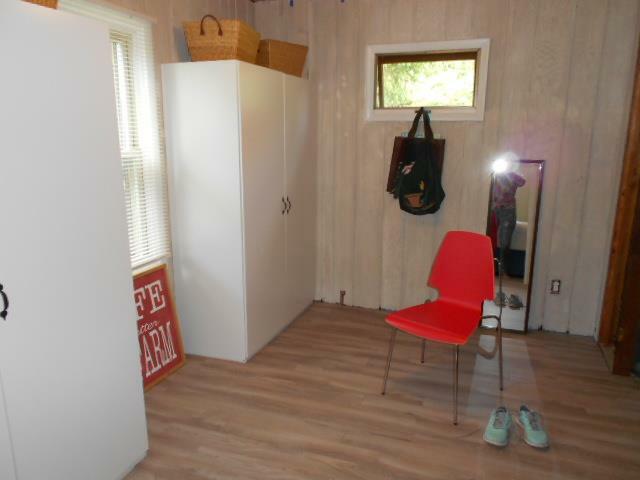 and shiplap for the living room and kitchen walls, tongue and groove pine for the bunk room expansion and 2 do-it-yourself closets for the master closet room. If I can just attach it all to the house, we'll be pretty much rehabbed. Fortunately my wonderful Rick is coming next weekend to help put the pieces in place. My hero! Everything has been going quite well but the toilet broke and I left a message for the plumber to please fix it before Thursday when I'd be back- thus giving 4 days for the repair. I was so excited as I drove to the farm Thursday because Rick was coming Friday and he hadn't seen the progress for 6 weeks- so much had been done. But when I arrived on Thursday, the toilet wasn't fixed and that same sense of despair flattened me out, not to mention that the temperature was to be in the 90's for the whole weekend. With so many things planned, including some fun time, I hated to call Rick to say he shouldn't come because I had a broken toilet. But when I did, he said he'd go to Lowe's, get the new wax ring and other parts and come fix the toilet. If he couldn't fix it, he'd leave and so would I.
Thursday, I worked at finishing the laundry room, which now that I've thrown out the dirty and highly questionable washing machine, has become the utility room. From the kitchen, I added a closet going into the utility room to recess the refrigerator. I framed the wall last week and this week started to apply the tongue-and-groove pine boards to close the two rroms from each other. Once the boards were secured (notice I ran out of boards for the corner :-( ) , I primed and painted them, put together a 6' tall shelving unit and added other practical organizational items. 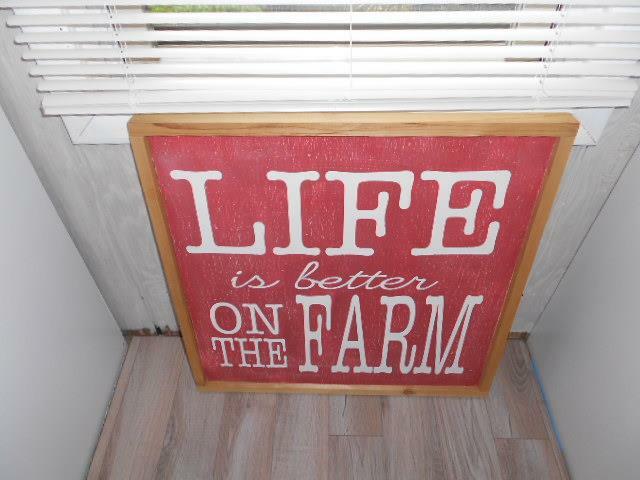 I've been going to garage sales to buy things for the farm that don't need to be new. I was lucky to get this back-of-the-door shoe holder for $2 (brand new in the package which said $14.95!) which I immediately thought would be great for all the cleaning supplies I have been using to erase the years of grime and neglect. It worked out better than I thought, with room for light bulbs, extension cords, some painting supplies, flower cutting shears and garden gloves. It's the most sophisticated and accessible "junk drawer" I've ever had! 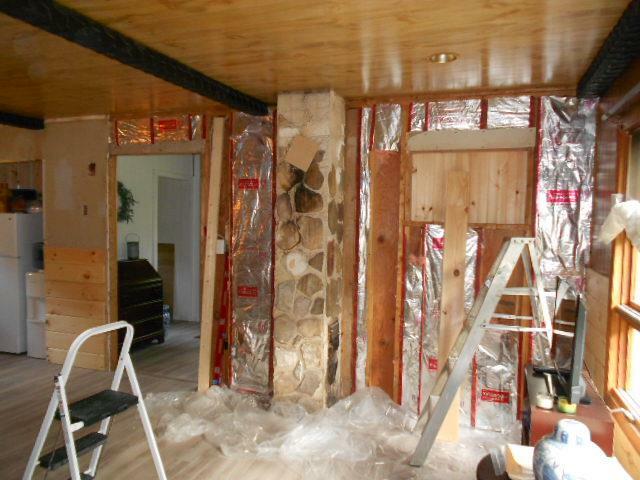 Over 20 years, Rick and I have worked together on 6 whole house renovations- 3 for ourselves and 3 to flip. We both like the work and both have individual strengths to bring to the project. We've spent so many hours at it, we've learned to dance around the stressful spots, give credit to each other when a compliment is due and have an ease of chatter as we go through the steps of improvement. He arrived on Friday with the bag of fix-its from Lowe's and started on the toilet. After 4 hours, the toilet was fixed and runs better than ever. It was a much better solution than buying a composting toilet which I was seriously considering! You may remember, I had a hole in the bedroom ceiling. The contractor who was coming 2 weeks ago never showed up and didn't return my calls. He was charging me $450 to sheetrock 2 ceilings. I had seen a picture of a ceiling from underlayment (which is a 1/4" plywood but with one finished side) which looked pretty good- so I thought I'd try it. The underlayment is light weight, is paintable and could be installed with Liquid Nail glue and finish nails. We had to first figure out where and how the studs ran in the attic and use a chalk line to make sure we were nailing into the beams. We based our grid on where the existing beams were so the pattern isn't made up of same sized pieces, but overall the look is pleasing- especially with the hole in the ceiling now camouflaged. The next step is to put batten strips over the seams and paint the whole ceiling white. 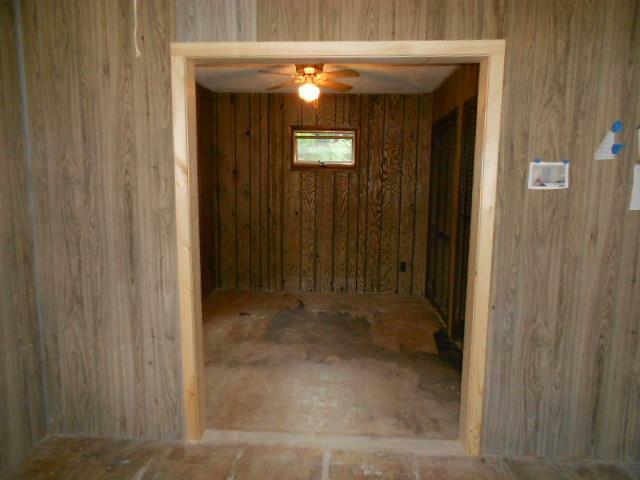 Of course the ceiling fan had to be taken down, and put back up. While it was down, I spray painted the components white and it looks like a new fan. The 80's brass and faux wood, good-bye! The paneled room is now painted white, with white trim and a design accent to be completed next week. We moved the trundle bed to the "new" bedroom and for the first time, I didn't have to think about bats coming down from the attic while I slept. The bedroom had been opened to what was originally the second bedroom. I have designs to make it into a walk-in closet room. Just because it's a small house, we don't have to feel like we're in a small space. The next day, Rick put together 2 4' wardrobes. These wardrobes were purchased from Home Depot - fantastic storage and economical- and have 3 shelves and a bar for hanging clothes. Eventually the melamine doors will be replaced with pine doors and wrought iron pulls, fitting better with the farm theme. The space between the wardrobes will have a window seat and cushion. I have always wanted a window seat! At the conclusion of the weekend, we saw that the raspberries have bugs, the exterminator attacked the carpenter ants and the fox still roams freely- making me wary of him every time I go outside. I'm sure my fox fears will diminish after I see my first bear! But the major change is how I've come to see my project. It's a broken down house, with a hundred more fixes to go, but when I share it with one I love, it's home and it's the best place in the world to be. Fortunately the weather offered up a brilliant storm and everything cooled to a temperature where home improvement was comfortably do-able. 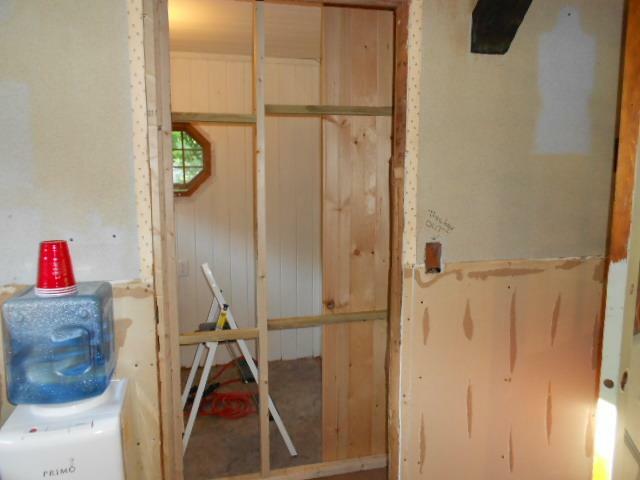 My project this week was (and is- I'm going back tomorrow) to take out the wall between the house entry and the "Bunk Room", creating a guest bedroom with an open and airy feeling. I decided on the name "Bunkroom"- which is a bit silly as I can't imagine any one of my friends climbing into a bunk at our age! But I bought a trundle bed at a yard sale, so I'll be able to sleep 2 guests on ground level but only take up floor space for one single bed. I had removed the inner wall covering a month ago, and couldn't wait to remove the whole wall, expanding the little room from 7.5' square to 7.5' x 13' long. 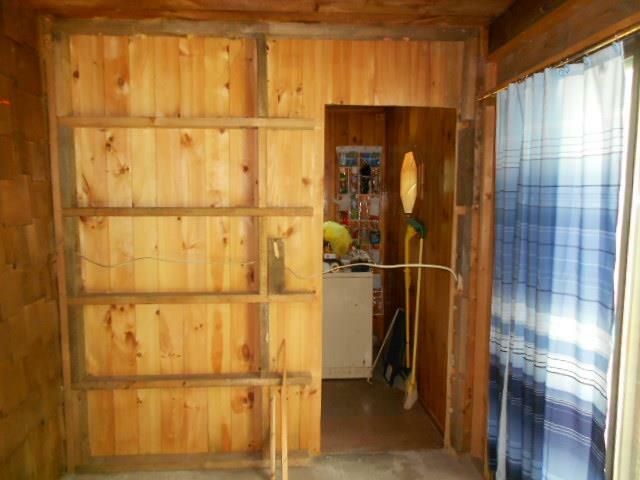 You can see how neat and clean the work site was and I started by trying to save the tongue and groove paneling on the inside of the room to use on another project. That became a folly when I realized the way the boards are connected, you just couldn't take out a nail and pull them apart without breaking the tongue or the groove. So I switched to Tracy's way- gimme the sawsall. It's really hard to believe a 7.5' wall- with a 3' door opening- could make so much rubble! I call that progress! Once I cleaned up the mess, I started on the tongue and groove boards which will finish off the room. I ran out of materials- and energy- so this is where it left off. The boards are being delivered Saturday and I'm hoping more of this project will be done this weekend. I still have the main entry door to replace, the ceiling in the entryway and the flooring to finish. The most immediate push was to get things ready for the NEW FLOOR (yep, you read right!) throughout the entire house which is starting on Monday, August 15th. Because of the unevenness of the existing tile and hearth, I decided to opt for luxury and hire Lumber Liquidators to do the whole job. Rick and I have installed yards of flooring in every renovation and at home, but this was my treat for me. I still had a lot of framing to do in doorways- which were widened- and everything had to be up off the floor.Since the delivery charge from Home Depot is $75 a trip, I had ordered a lot of building supplies which almost covered the entire living room floor and the plan was to attach everything to a wall or ceiling over the weekend. Also I promised the electrician Dave that I would clear out the attic so he could move around easier- well, that never did happen- but with Rick to help, I thought all things were possible. Finally, I found someone to replace the broken sliding door. 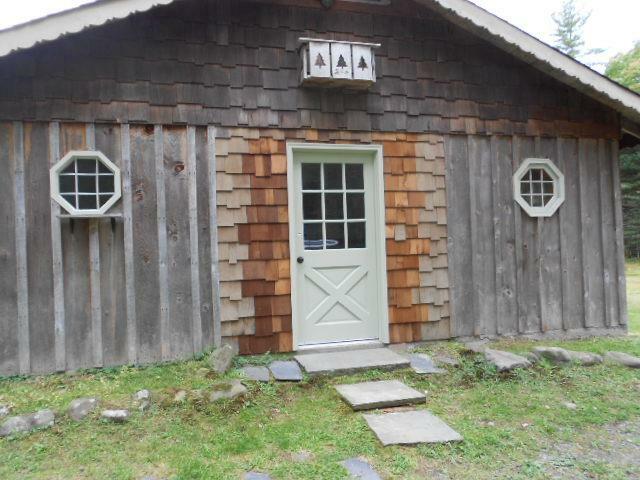 The "new door was actually inside the house, but it's and exterior Andersen door and in perfect condition. Ed had sent me photo of the finished project earlier in the week, but when I pulled into the drive it was so beautiful to see. Finally 7 weeks and 3 contractors later, the door is in the right spot to reorient the "front" of the house from the road side to the driveway side and the door looks like it was always meant to be there! 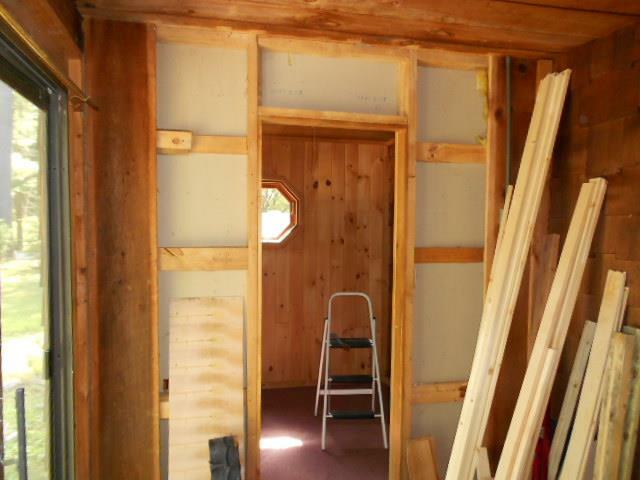 Everything rests on the completion of something else and the new floor, electrical stuff in the entry and the walls in the bunk room couldn't be completed without the door being in place. So finally, I could move forward! When Rick arrived on Friday, the first order of business was to figure out why the irrigation to the raspberries wasn't shutting off automatically- though I did manage to figure out how to manually turn it off. Then we put luan underlayment on the closet room ceiling- short just 2 small pieces to complete the job. 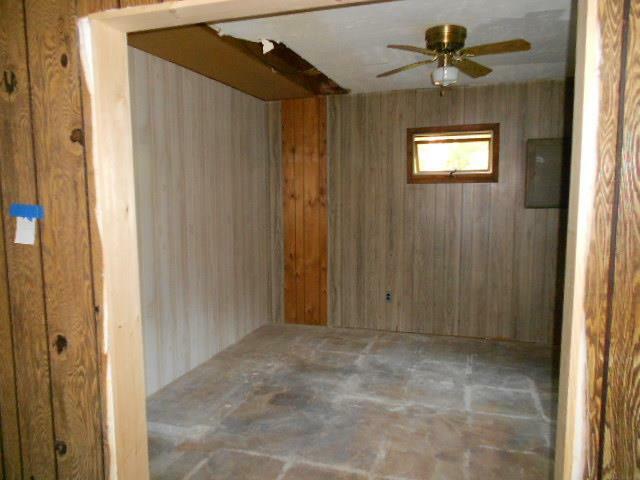 Then we sheet rocked the entry ceiling which is now open to the bunk room. It was a lot of arm raising, but we finished that and the brightness of the sheet rock compared to the dull and dusty wood ceiling that was there before is so cheerful. It's hard to offer a friend comfort when the whole house is topsy-turvy- building supplies scattered everywhere, no air conditioning, no couch just hard folding chairs to relax on and no stove to warm the foods I had made (cold eggplant is really very good, though!). Instead, Rick offered me the comfort by taking me out to dinner followed by evening rides in the country in his air conditioned car and laughing a lot at the seemingly endless fixes needed around the farm. It was a weekend of good progress and happy memories. When Rick left on Sunday, I decided to stay on- we hadn't finished everything for the flooring guys and the flooring had become a beacon of progress to me. It had to be done! 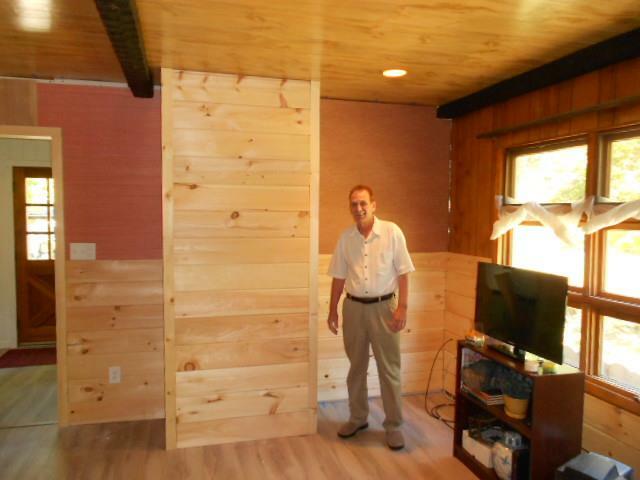 So I started by finishing the tongue-and-groove wall boards in the bunk room- just 4 boards short of finishing the room. I moved the ship lap boards which are to go on the great room walls to the wood shed , finished the door opening to the pantry and closet room and closet in the closet room, sheet rocked the main kitchen wall (which was quite disgusting), and moved the 18" kitchen cabinet to create a space for the stove relocation. I love this house so much- this broken down, always needing a cleaning, perpetual challenge of a house. And I think it loves me too because it leaves me gifts. While widening the closet entrance in the closet room, I found a thimble- always a handy thing for a seamstress. It's not real silver, but it is elegant and fits me perfectly. 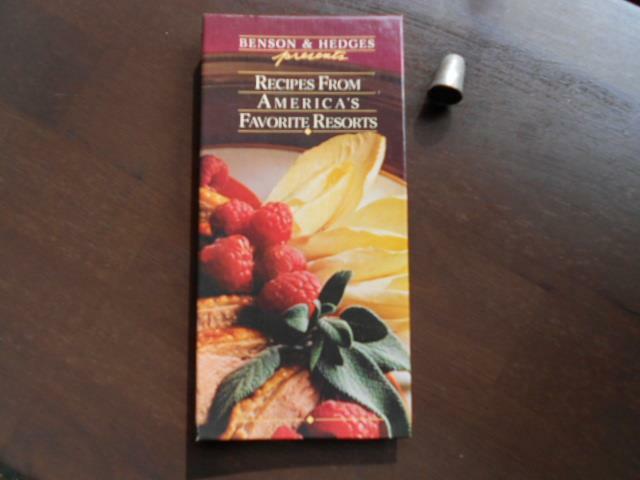 When I was cutting out the kitchen cabinet to relocate the stove, I found a recipe book underneath and the picture on the front is a raspberry dessert- it looks yummy and may prove to be fortuitous! 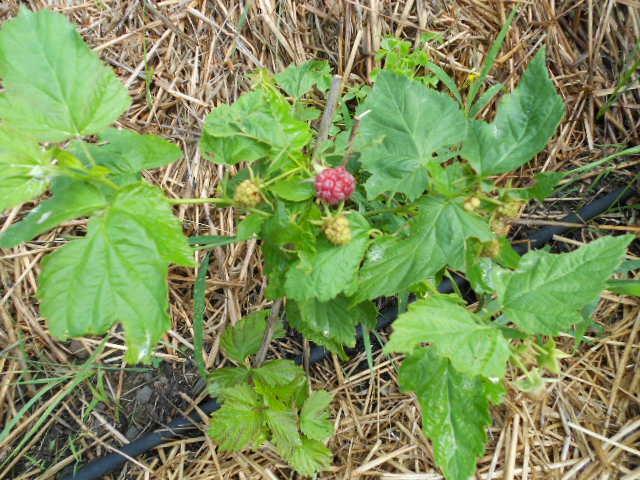 And the farm offered up the first berry of my planting- a gorgeous, plump, firm berry, the only red one in the patch! I'm sure this was the best tasting berry ever! Between the fence, the plants, the rototilling, straw and compost, I have a $3000 investment so this berry is at least worth that. But it's like the commercial- the first berry, priceless! The floor team showed up as promised and was working inside the house. They had quite a job- jackhammering out a (fake) stone hearth and the kitchen ceramic tiles which were chipped and discolored. After the dust settled- on everything!- they used more than 10/ 50 pound bags of leveler in an attempt to level the whole great room floor. It was not easy and they did a fine job. My need-for-clean kicked in and they were hardly out the driveway the first day when I started wiping up the dust! I selected a low sheen, laminate with a coastal vibe. I was looking to lighten the house while still having something which would hide the crumbs of dirt brought in from the field. It looks more beige in the photo, but actually has a gray overall cast. The men started in the bedroom and closet room, then made their way across the whole house to the bunkroom. The more they did, the more I liked it- so by the end of their 3 day job, I was crazy for my new floors! Not to mention, putting a bare foot down before was a gross experience, now it feels fine. I'd hired Lumber Liquidators to do the job and they sent the best team to do the install. Four guys, all kind and perfect gentlemen who knew their craft. I cannot say but the nicest things about them all- it was a totally pleasurable experience. and staged the kitchen- so happy to see the appliances finally in their place. The stove has a griddle on top- perfect for farm breakfasts of raspberry pancakes. I must confess that my time at the farm this week was of total indulgence. The berry bushes weren't expected to produce much this first year, but for a raspberry lover like myself, walking out into the yard and picking a small handful and savoring each one, is a luscious experience. At one point I daydreamed how many ways I could enjoy a raspberry- there are soooo many- and I was reminded of the scene from Forrest Gump when his friend was talking about shrimp. I do believe there is nothing "raspberry" that would not appeal to me! One of my simple favorites is raspberries on vanilla ice cream- I let the ice cream soften and mush the berries into it- so yummy! When I chose to get new floors, I knew it was a trade off for new kitchen cabinets and a long list of other longed for items. But I love the floors and the feeling of cleanliness they've added- so my main job this week was to paint the kitchen cabinets in an attempt to make due. Starting with a special cleanser recommended by the Lowe's man for "the worst of the worst", the job was more intense than I thought. 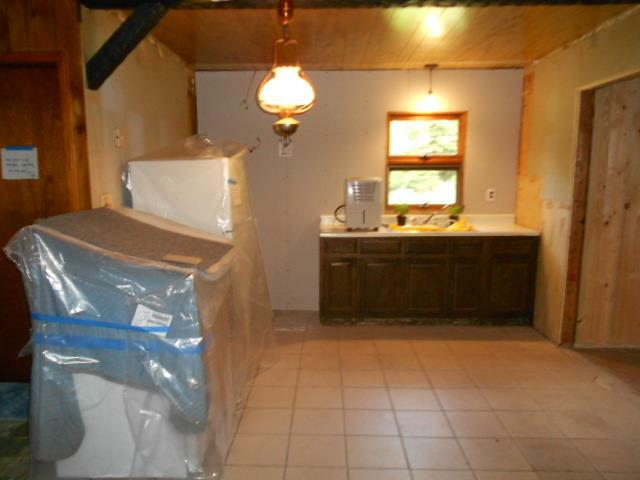 The house had been vacant for two years and before that had been occupied by a 60 year old widower who must have had bad eye sight- I like to give the benefit of the doubt- because years of grime were attached to the cabinets. After six hours- yes, six hours- of cleaning every crevice, drawer and cabinet front, inside the spooky parts next to the drain (ugh! ), I seriously wondered if this was a good idea. If I had a plumber - which is rarer than hen's teeth in Eldred (I think there's some secret list, but haven't been able to track it down LOL) to detach the sink, I would have pulled the cabinets out and made due with nothing... but now they were awfully clean, for what they started as. So I carried on with two coats of primer and one coat of semi-gloss. Even with that, clearly they are in used-and-abused condition. According to Wikipedia, "Trompe-l'œil is an art technique that uses realistic imagery to create the optical illusion that the depicted objects exist in three dimensions". I was thinking about that when I was inspired to paint the countertop. I had already demonstrated a loss of hope that this would be a permanent solution when I spray painted the old and rusty (though very clean!) hinges rather than change out to the new ones I had brought with me. 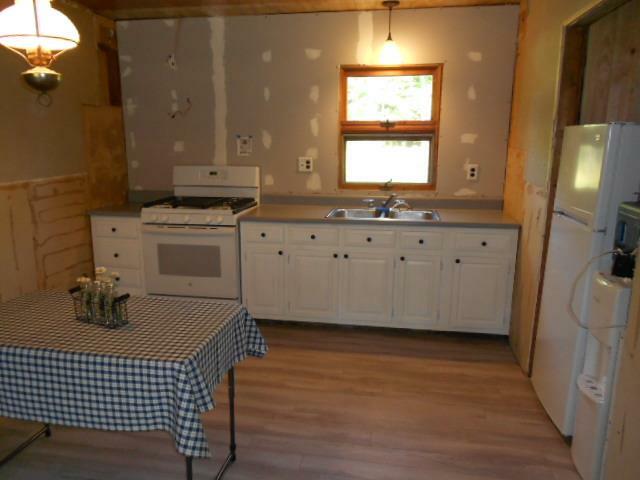 And while I had fancied a new countertop once the cabinets were painted, I decided not to invest a single penny into this kitchen set-up with these cabinets. As luck has it, I had brought a can of previously opened gray paint and I had the primer too- so why not? So while the counter top will have limited functionality even after two coats of urethane sealer, and the drawers pull out weird and rest uneven, I have created the illusion of a nice kitchen! 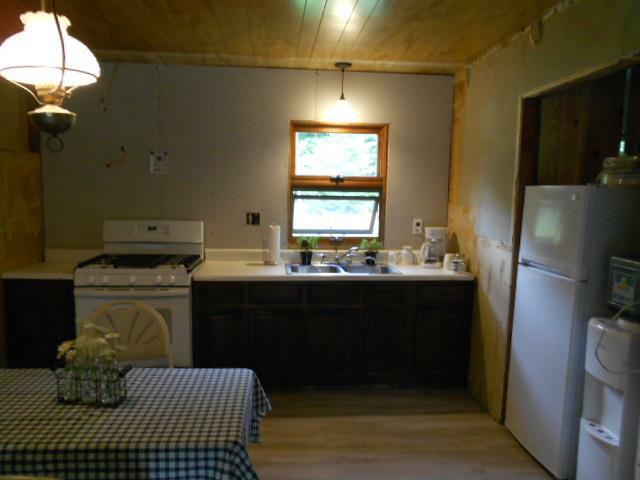 As the paint chips off, inevitably, it may add character to the space and I may realize that a farm kitchen needs character to be truly homey. But now I think it's a good thing I gave up being a perfectionist a while ago! In the 2 days before Rick was expected, the electrician finally finished. Almost every project was on hold waiting for an electrical adjustment. So now we have lights in all rooms and outlets that work, which is sooo handy. I was finally able to finish the tongue and groove wall from the bunkroom to the laundry and prepare to paint. The knots will bleed through paint, so they must be sealed. Two coats of a paintable varnish was applied to all knots, followed by a tube of paintable caulk to the joints on the windows, posts and beam and I was finally ready to paint a full coat of primer, then the finish coat of paint. The room still needs base and crown moldings, half a paneled ceiling, door moldings, a door to the laundry room and décor, but I'm happy as it's coming along. Being a holiday weekend, Rick came to the farm to help me with some things that needed 4 hands. I really love having him with me- it's much, much more about the fun time we have than the work that gets done- but we did a lot. 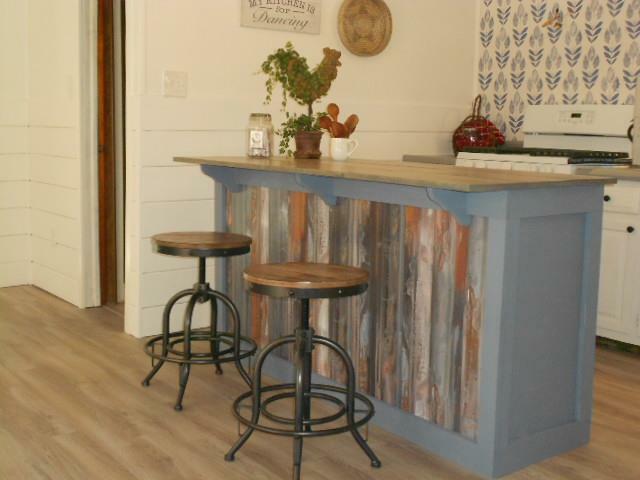 If you watch HGTV's Fixer-Upper, you know that shiplap is a style of pine board often used in the 30's and 40's to strengthen the frame of a house. Sheet rock or wall paper could be applied over it as a decorative finish. Now it's a popular wall board which can be painted or left natural. 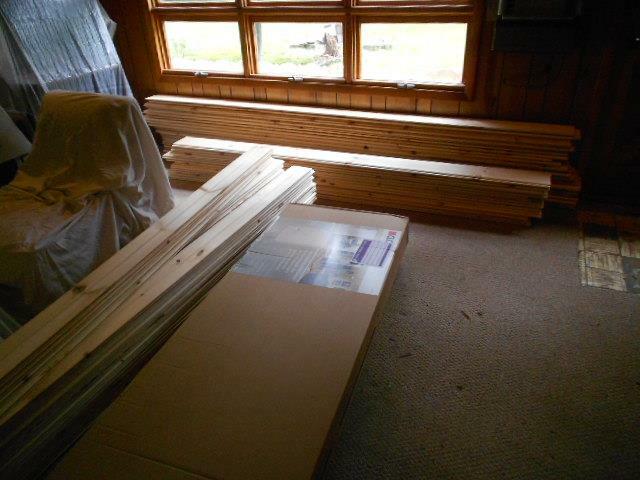 The boards I ordered were 8 and 10 feet long (8" high)- I definitely needed an extra pair of hands to install it. I'm using it in the great room (the tiny great room ! LOL) as a wainscot, up just 4 feet. The process of leveling a line around the whole space- over the doorway openings, past the proposed fireplace chase, omitting the prime kitchen wall- was quite a challenge. And sometimes we're silly, using a 4' level (which is sometimes level) with a 12" level on top, assisted by a lazer level line and what do you think? Each line was different! A lot of these serious calculations come down to eyeballing it and doing the best we can. We did the room over 3 days and though the jig saw broke at the absolutely worse time, we were undeterred! 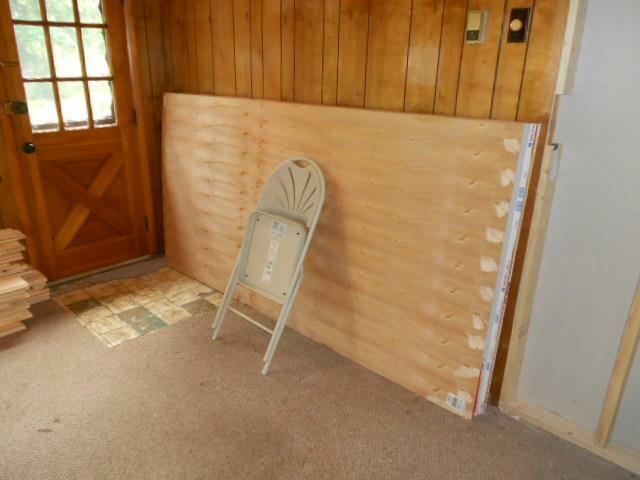 I haven't framed out the hearth chase for the anticipated gas fireplace so we didn't do this wall. Ironic, since that was the first wall slated for demolition which Tracy and I completed within 3 hours of owning the house! Fake stone just isn't my thing! It was a long and hot week, but I loved it. When I got home, Rick had already bought a new jig saw so I can carry on with my work. It reminded me of the "good ol' days" when, for Christmas, he would buy me a piece of jewelry and a tool. One year a beautiful necklace and a table saw! The next, a blue sapphire ring and a chop saw! Oh, what a man- he knows my heart so well! I think there's a saying that a girl can never have too many diamonds. I'm like that, but I like tools more! For the first time, I got to the farm and felt no urgency to work on or finish a project, clean something or fix something which had broken- is this what normal life is like? Oh, don't misunderstand, the projects are on-going and the furniture tops are a bit dusty from the ceiling fans always spinning to circulate the air, but all-in-all, the house is becoming a home, even just for short spurts of time. 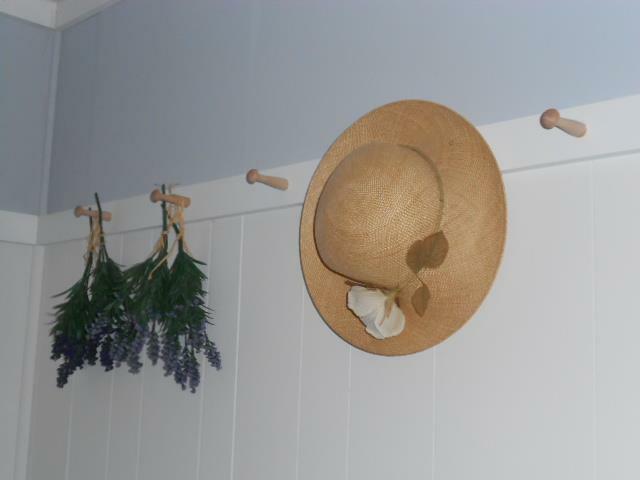 The entry is part of the "bunkroom" and I had brought trim with me to finish off the door frames. Michael Winstanley, my friend who cut the door from the utility to the entry back in Farm Week 4, will be amazed that finally this is done (it's now week 15)! 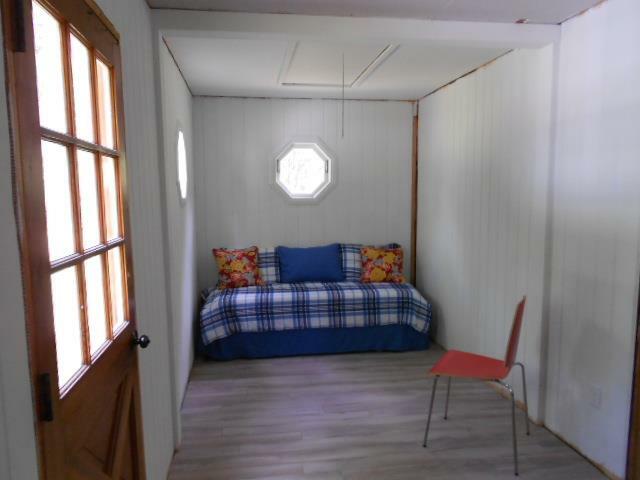 The "Bunkroom" side is all trimmed out, but I forgot to take a picture- :-( , but it looks cute and even has some décor. 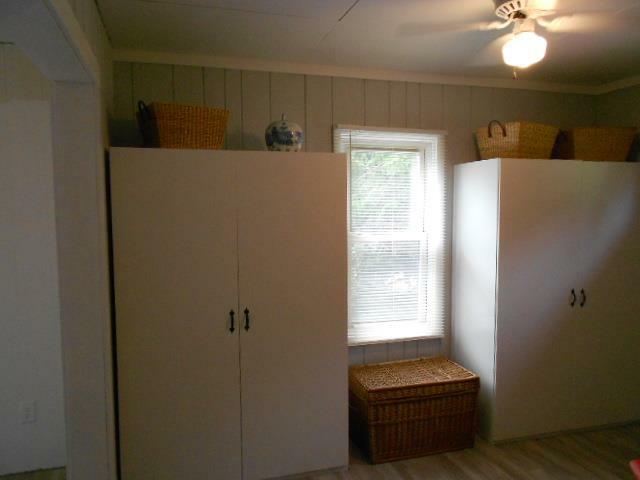 Meanwhile, I still had in mind to paint the closet room, so I did and applied the ceiling trim. I thought I was going to rout out the moldings myself, but decided to leave them square-edged. The first time I ever heard the expression "lipstick on a pig" was from Sarah Palin when she accepted the nomination for VP, but I knew exactly what she meant. This house can't be too fancy so I tempered my desire for thick crown moldings and high curved-topped baseboards and decided to go with stock one-by lumber. This is the nicely finished window wall. This is the other side of the room which is painted but needs some help- seriously! I'm trying to design a clever cover-up since the water holding tank needs constant ventilation to prevent mold from forming (the tank sweats when it's hot) but I'm drawing a blank. It's a challenge! Real estate business and Missing-my-Rick pulled me back to New Jersey on Sunday, but I had a great few days. Quiet and solitude changes a person in ways that can't be measured and it's humbling to be surrounded by the beauty of really tall trees, to see the outback peppered with deer grazing at evening and watching the sun gently cross the berry patch during the day. Country life is sensory overload! I wish I were more poetic so you could feel the beauty of it all. 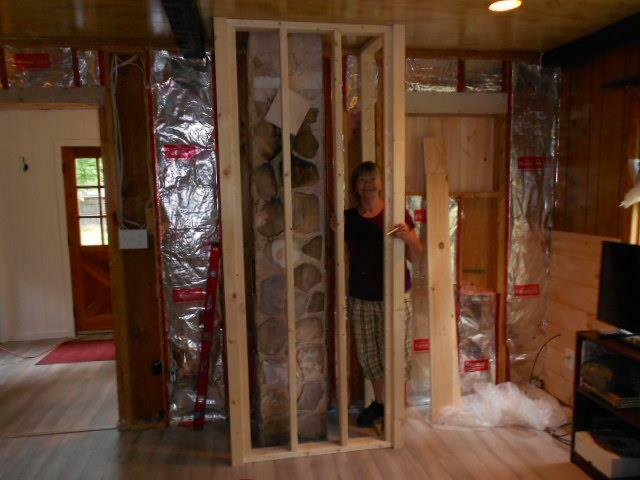 (BTW, that's a pencil in my hand), then we covered the framing with shiplap. 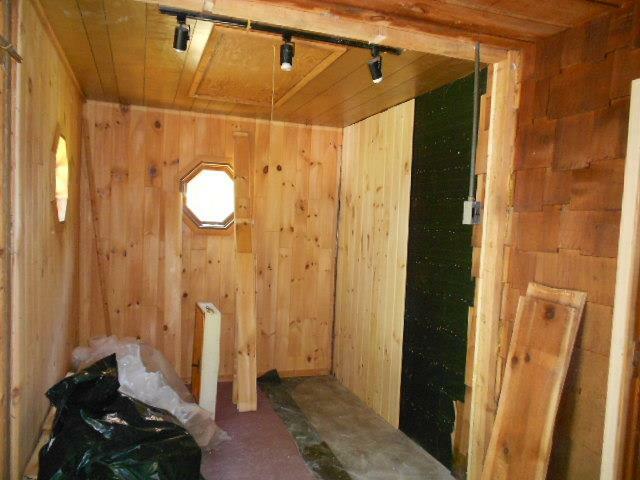 The side walls are shiplap for the bottom half and builder underlayment for the top half- all will be painted white. Now, that's better! The other walls still need the underlayment on the top half, but the shiplap is done around the great room and kitchen- wow! The chase bumps out about 20" which leaves a nice space for built-ins on the right side to house the TV and other stuff that needs a home. This would have been so hard to finish without Rick helping me, but mostly I appreciate the fun we have doing projects together. When I got to the farm on Wednesday, I had in mind to paint the living room part of the great room ceiling- sounds easy enough, right? Years of chimney smoke and nicotine accumulation from cigarettes and cigars, created a tough cover-up. After attempting to cover the kitchen part of the ceiling with the normal prime-and-paint methods and still having a blotchy and unacceptable job, I consulted the paint specialist at Home Depot and found out it must be primed with an oil based paint- the only way to guaranty a perfect cover. I'm intimidated by oil based paint- so runny, so messy and so permanent on the face and hair! But I had to muster up to the task so I donned my kerchief, pulled down over my brows, wore rubber gloves and a sweatshirt (even though it was 75 degrees) and had at it. Just a tip I picked up along the way- put on a lot of face cream and lotion on your arms for an easy clean-up. The paint spots just wash right off from the greasy areas of the skin. 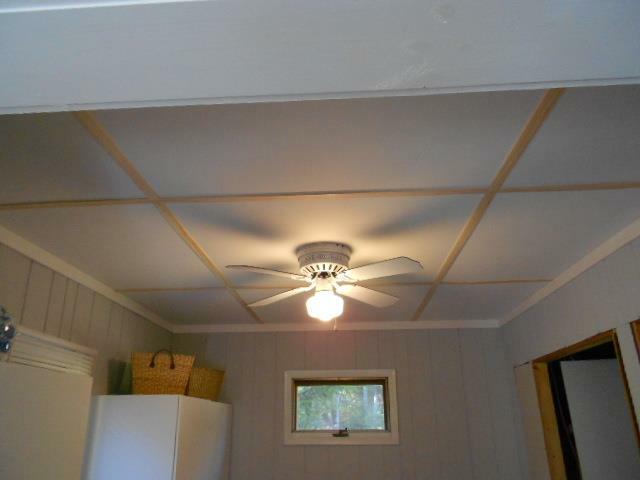 Once the primer was on (I redid the kitchen, too), I painted the ceilings with a good quality latex paint. And what do you know? THE STAIN STILL SHOWED THROUGH! OMG, I really was disgusted, but with a total of 5 coats of paint on the kitchen side, that looks good. At least I could move onto wallpapering the feature wall in the kitchen- finally total satisfaction! I ordered this wall paper in May- loved it from the moment I first saw it- and I've been waiting for the kitchen ceiling to be done so I could hang it. Please take note of the "window curtain". Who knew that translucent trash bags could be used for privacy? Oversized windows do present a challenge when you need privacy but don't want to invest a lot of money in a temporary solution. One of the best things I did was to buy shower curtains to cover the sliding door and the 8' front window. Walmart has sets, with rings included, for around $13.00. They can be put on any stick or old curtain rod and, depending on the fabric you choose, can be total blackout. When the sliding door was taken out, I modified the curtains to cover the doors which have glass panes. Using black tacks, the existing ring holes slide over the tacks and presto, evening privacy. In the morning I can take them off in about 5 seconds, fold them up and put them away for the day. While this may not be the permanent solution to drapery or the coolest decor, it is a fast, easy and cheap solution for now. 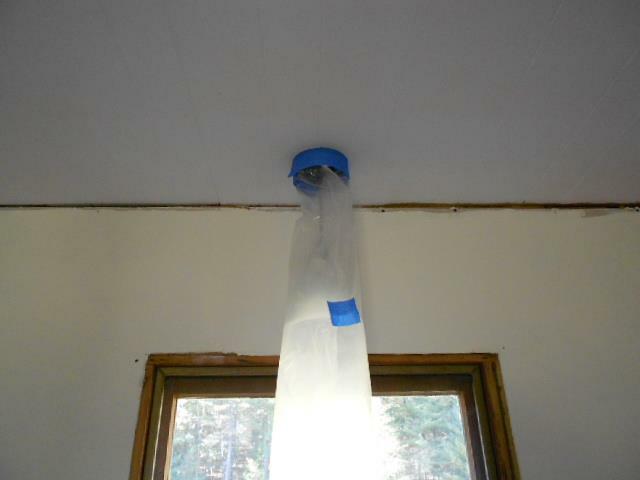 Speaking of shortcuts and tips, I thought I'd pass along how I protect pendant lights when I am painting around them. 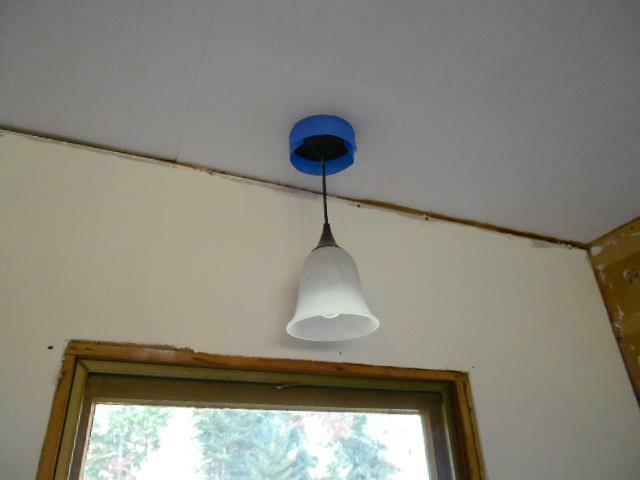 Starting with 2" painters tape, encircle the light, butting the tape right up to the ceiling and pressing around the fixture, being careful not to press the tape into the bottom of the light cap. This insures paint will not seep onto the light. Then, because part of the sticky part of the tape is available at the bottom, from the inside press light weight plastic- dry cleaning bags work great- onto the tape to cover the fixture. Easy peasy- no more having to cut in carefully around the top of the light and no splatter on the pendant. With this method (after cutting in with a brush), you can roll the paint roller right up to the fixture so the texture is consistent with the rest of the ceiling. Just 'cause it's fun to be outside on a beautiful fall day, I decided to paint the door and frame, then couldn't help myself and painted the two small windows by the door. If I'd have had a tall ladder, I would have painted the gingerbread trim at the roof top, too! That's Behr's paint, color Urban Nature. I'll be heading back to the farm next week with plans to finish the great room walls. It could get cold there anytime, so I'm putting in a few extra days when ever I can. There's yard work to do, and a punch list of odds and ends to complete my goal of a renovated house before the snows fly. Because there's no heat, I'll have to have the pipes drained before a hard frost, then my time will be limited as to what I can do in my parka and mittens. 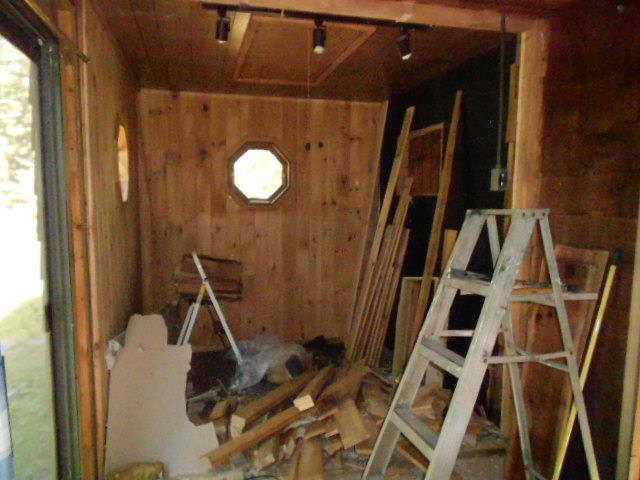 In all the plans I make for the house renovation, I plan it so I can do it myself, but sometimes this backfires on me. 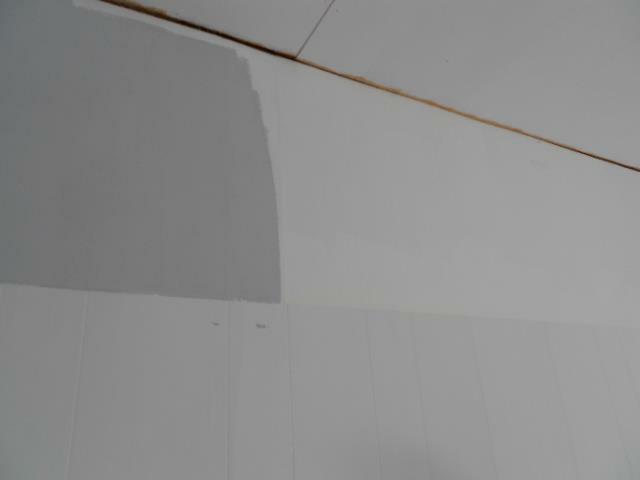 The next project I wanted to check off the list was the upper half of the great room walls which are 4x8 sheets of underlayment (like plywood, but just 1/4 inch thick).The sheets are very floppy, and though I can pick them up and move them, I can't do any measurements while I am holding them against the wall. The application was tricky because the underlayment had to be cut around the door and window frames so I had in mind to hold the panels on the wall, then scribe the doors and windows with new framing boards, then cut the excess underlayment (if that's hard to understand, it's even harder to do! LOL) Thankfully, Rick understood that I could not possibly do this myself ( it's kind of like a one armed wall paper hanger situation) and he offered to help me out for a few days- phew! When he got to the farm, it was raining so we couldn't do any cutting outside which is where I set up the saws- bummer. But I always have the materials on hand for any number of projects so we put up ceiling molding in the closet room- another project which was much easier with 4 hands. If you remember, Rick helped me apply the new ceiling over the existing cracked, textured and generally ugly ceiling which came with the house. 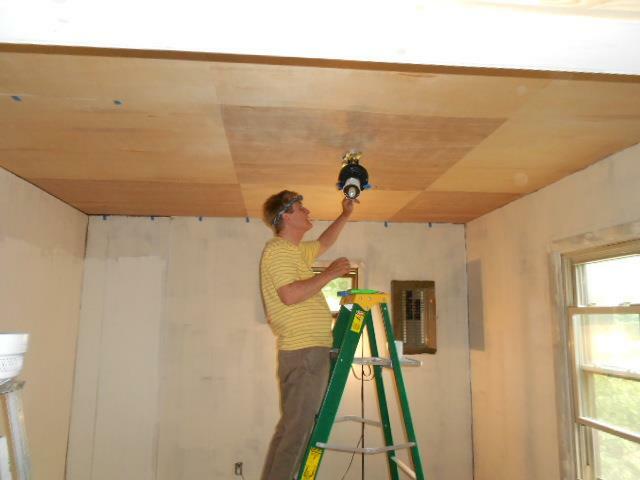 Several steps were in between the beginning and the finished product- spackling the nail holes in the ceiling, painting, putting up the ceiling molding, then the batten strips to cover the seams. At some point I'll paint them (after spackling and caulking), but for now, I'm happy to have the carpentry done. For the past two weeks, it's been a mad dash to the finish line before having the water turned off and the farm house buttoned down for the winter. Finally. I'm on to the fun projects! For three days I concentrated on the bedroom and closet room. Both projects were stalled for several months waiting for the finishing touches. Paneled walls are so 60's... or 70's... or 80's, so to change it up a bit I wallpapered the top section of the wall with underlayment. This is a great product- about the weight of poster paper- and can be used to smooth out concrete block when finishing out basements. Once applied, the underlayment shrinks over the panel grooves and dries to resemble flat surfaced sheet rock. It can be painted any color and when trimmed out gives the illusion that wainscot has been added to the bottom wall. 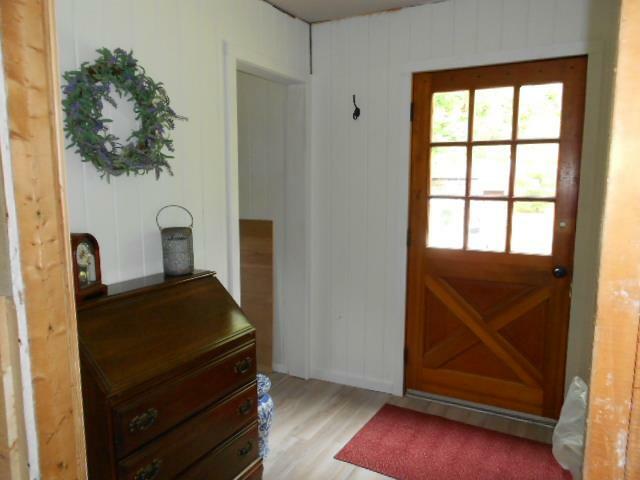 With pegs around the room for hanging bathrobes, straw hats or purses, a new headboard cover, finished out ceiling to cover the big hole and small electric stove, the room is cozy, clean and restful at the end of a busy day on the farm. The closet room needed some imagination but was solved with 3 $1.00 garage sale items! 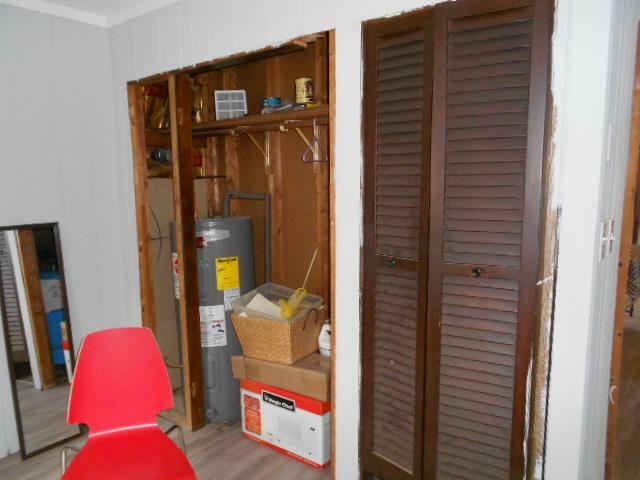 The main concern was that the existing closet housed the water heater, which needs to be accessed for draining and service and the expansion tank for the well water which sweats and needs constant ventilation. I had purchased a mirror, new hangers and a curtain hold back for $1.00 each at yard sales. Using 3 hollow core doors from home which I saved when we replaced our interior doors with 6-panel ones, I made a screen and painted it the wall color. It can be taken out and provides ventilation since it's not permanently fastened. I added a clothes pole for hanging clothes and mounted the mirror to the newly framed and sheet rocked wall (sheet rock was left over from another project). 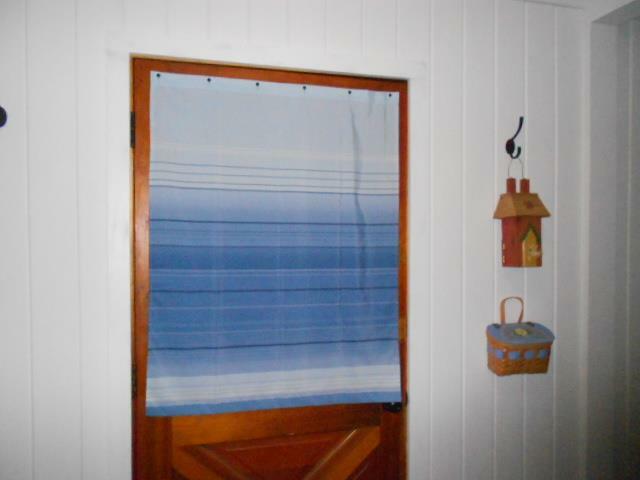 An old-fashioned screen door will cover the blue tank door frame when I can find one (!). 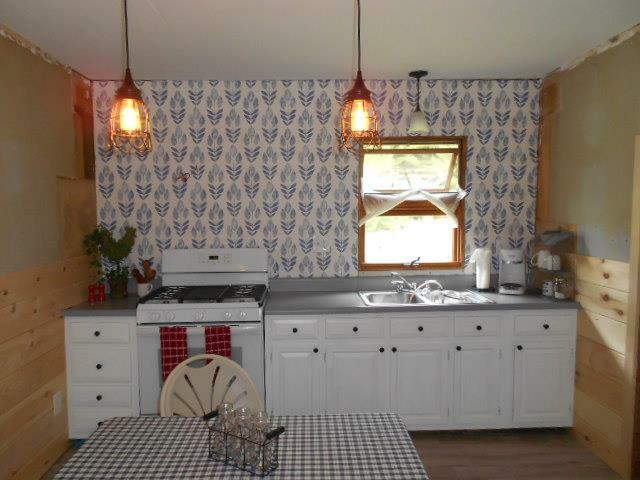 A curtain made from fabric I had on hand brings this project well under budget! After a few days at home, I headed back to the farm to finish the great room. 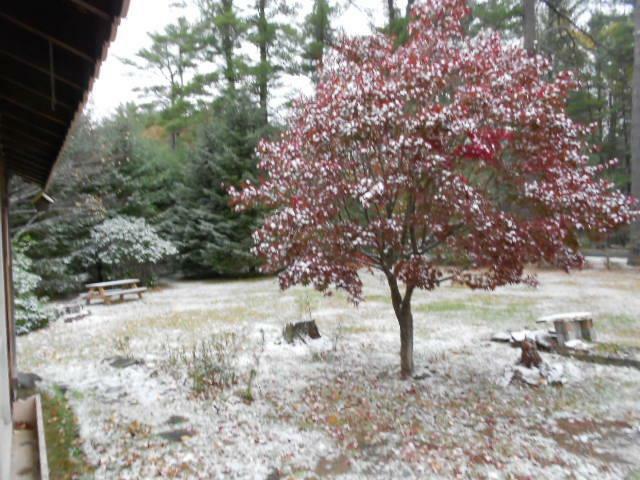 I was surprised to see a light dusting of snow the first morning I was there (October 27th), but happy to report the electric heaters do the job perfectly and I was toasty at night. 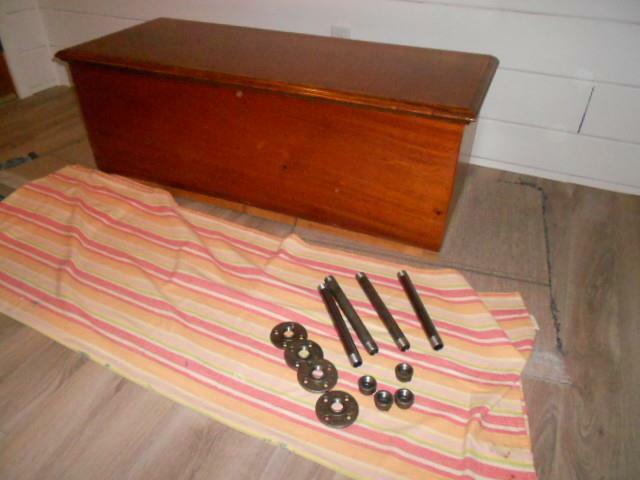 Years ago I bought a Lane hope chest at a garage sale for about $15, as I recall. My mother used it for many years at the foot of her bed to store extra bedding. I thought for that very reason, it would be good at the farm but I wanted to update it a bit and give it an industrial vibe. Using 3/4 inch plumbing parts, I created legs for the trunk. I love it! The trim at the bottom of the trunk has been missing since I got it, but I'm thinking men's leather belts will finish it off when I can find them at a garage sale. After a concentrated 4 days of nail setting, caulking, sealing wood knots, applying trim, priming and painting, the great room is somewhat finished. I just need to replace the plastic bags I've been using as curtains! 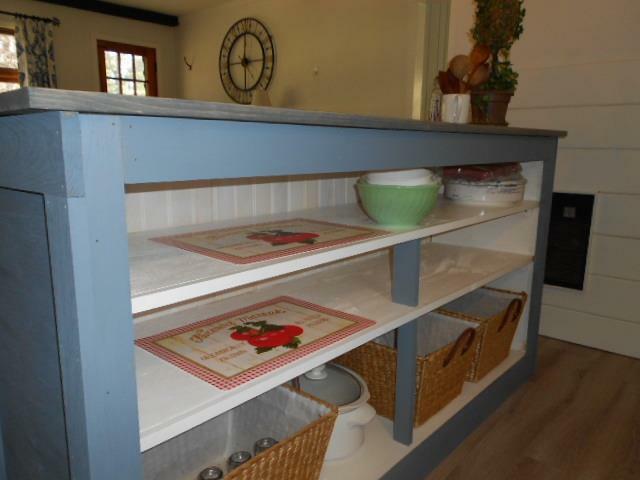 At home, I've been building a kitchen island for the farm. I couldn't really decide on the style because I always go with "pretty". But life there is far more casual, and it's meant to be easy going and not fussy. 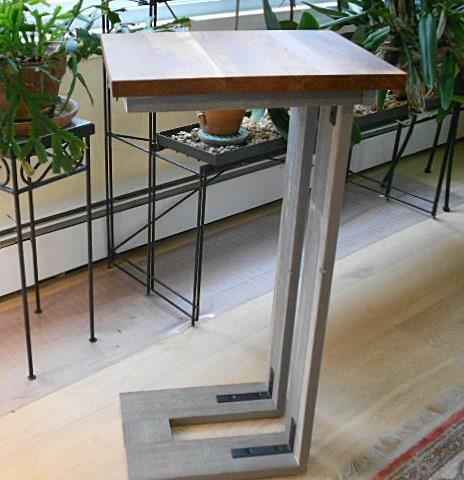 So I thought to bring in a little rustic to the design of the island, just to temper my more formal leaning. The finishes didn't matter because I had to take it to the farm in two trips so I had plenty of time to decide the details later. I've moved most of my tools home now, so I cut the pieces and put it together there. Then disassembled it and took it to the farm, where I assembled it again. I started with a box- framed bottom and top connected with tongue and groove boards. The back side is open with shelves for kitchen storage. Then I went back home and built, stained and varnished the top, cut the "rustic" detail and painted out the trim (which would be cut on-site). 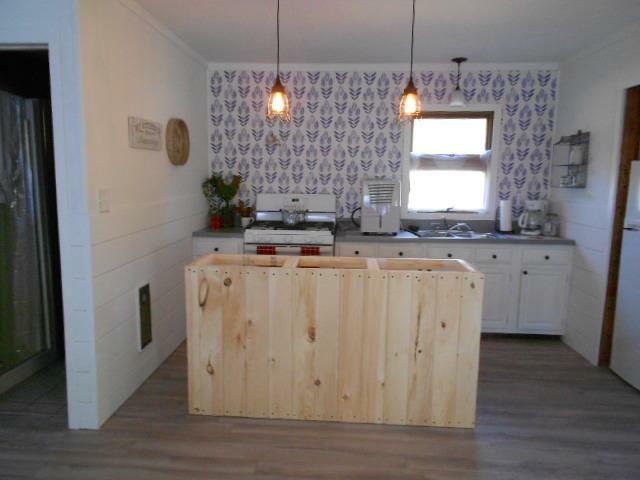 The rustic front is Pergo flooring though I think they make photographic wall paper which would have been cheaper and also effective but maybe not durable enough for boot scuffs that you expect at an island. I think it looks nice in the space. Since I opted not to replace wall cabinets, the extra storage is a real boon and who wouldn't want five feet more counter prep space? For those of you who were questioning my acceptance of plastic bags for curtains (seriously, it was me who was questioning myself- how long could I endure it? LOL), I finally had time to make curtains for the front windows. Big sigh of relief when those were hung! 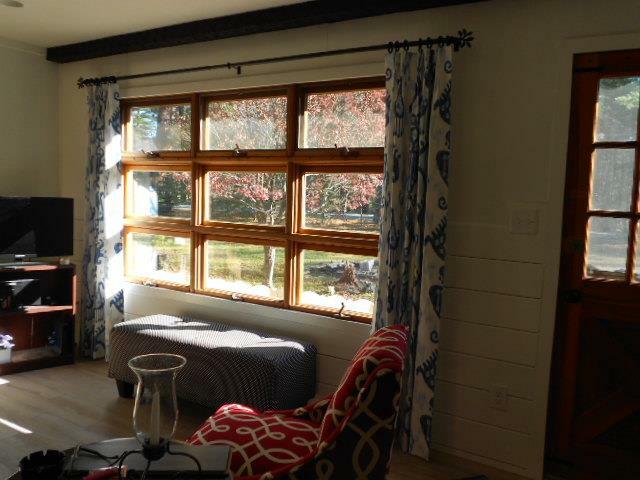 Curtains and island- my last two must haves for the farm house this year. It's been a fun, exhausting and joyful renovation and I will always be thankful for help from Tracy and Rick, the Jim Akt Team of landscapers who mow the lawn, Eddie and Team for helping install the door and Dave and Pauly who did the electrical work. We all made quite a difference in less than a year. I hope you're not starting with such a dismal room, but if you are, there's hope to have a beautiful and comfortable end result. 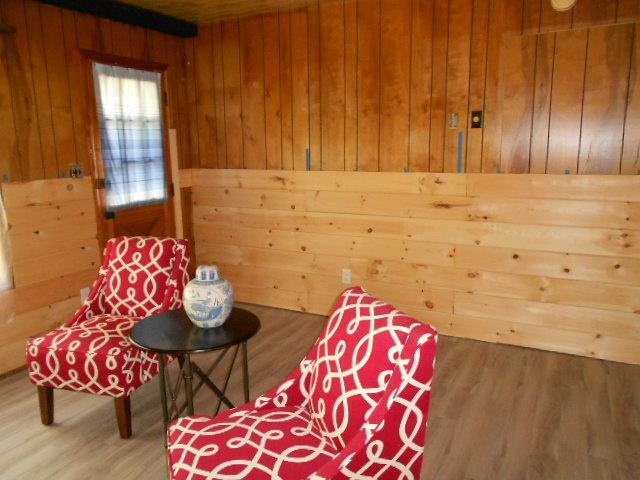 Save yourself the trouble of ripping out old, dingy, so 60's paneling with a tip that can enhanse any design style. It's fun to have your future projects where you can see them- it's easier to start collecting the pieces you'll need to put them together! 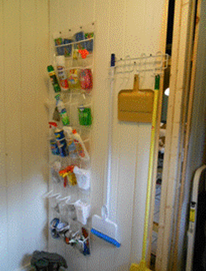 So handy for a wall in the pantry or laundry room. Is the "C" for couch or computer? Any way, it's a handy table to have!